MTA Metro-North workers doing work on the Bronx R.O.W. track project. Photo courtesy of MTA Metro-North Railroad. 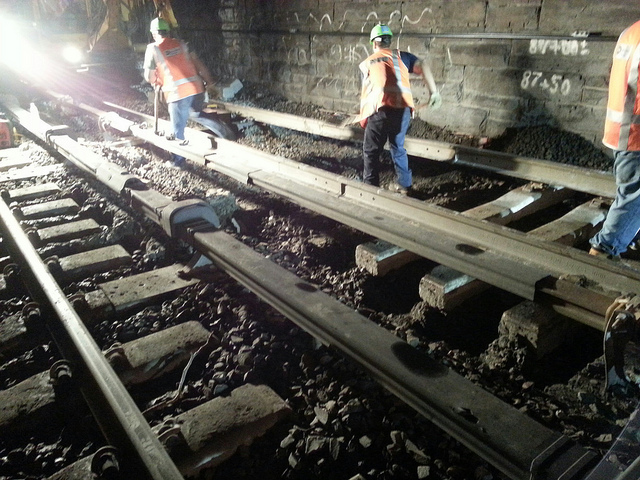 MTA Metro-North Railroad today announced the completion of an extraordinary track reconstruction effort that began in July 2013 on the tracks through the central Bronx used by New Haven Line and Harlem Line trains. The result is a safer, smoother ride and improved operating speeds. All four tracks on a six-mile stretch from Melrose to Woodlawn now allow for speeds up to 75 miles per hour, resulting in improved performance and reliability in time for the May 11 schedule change. Trains were limited to 60 miles per hour prior to the start of the track reconstruction project. Full train schedules have also been restored to Melrose and Tremont stations, where customers during the morning rush hour recently had used temporary shuttle buses to connect to Fordham. The project began on July 1, 2013, with crews first focused on Track 4, the southbound local track. When work on that track was completed, crews shifted their attention to the adjacent express track. By November 17, crews had finished rebuilding Track 3, the northbound local track. At that time, work was suspended until the spring. Track work is a seasonal activity, and it is suspended each year during winter. This April and May, work resumed on the last of the four tracks to be rebuilt, Track 1, an express track.